Hey folks, in the interest of getting the word out and showing Japan’s tokusatsu heroes that their fans want them to come to the US, I wanted to help promote this upcoming convention in Pasadena, California. JAPAN WORLD HEROES is taking place in just about a month from now — August 25th, 26th & 27th at the Pasadena Convention Center. 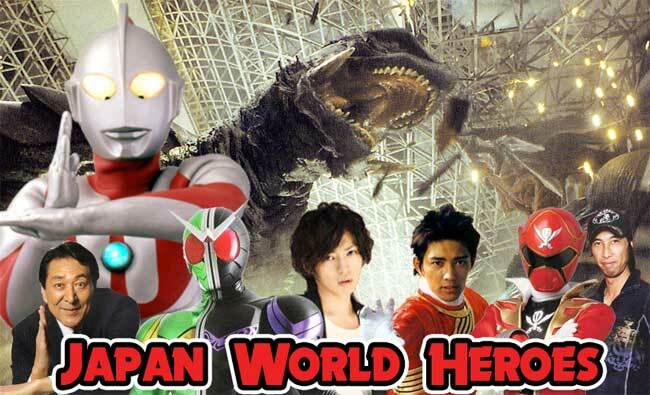 I asked the showrunner of Japan World Heroes, fellow nerd and toy collector extraordinaire Scott Zillner to do a spot on the Kaijucast to help dish out the hype! Scott also helms two other popular indie show, RoboToyFest and Power Morphicon, so I can’t wait to see what he’s putting together for Japan World Heroes. I am so very excited for this show and I hope to get involved with some more cool stuff during the convention. Make sure you follow the links below for tickets and show details – including information about the guests, events, hotel and more! TICKETS: Get your tickets through GrowTix here! …Also Hollywood Tokusatsu group Team Fujiyama Ichiban will be appearing at the convention! ATTENTION COSPLAYERS, JAPAN WORLD HEROES DOES HAVE A COSTUME CONTEST! Follow this link for more information. JAPAN WORLD HEROES has teamed up with the Pasadena Sheraton (located just behind the convention center) with a special rate for the convention. Follow this link for details. And if you needed another reason to attend, I’ll be tabling in artists alley with (I’m sure) a number of other Kaiju and Tokusatsu influenced artists. I’ll have as many Kaijucast prints, patches, lanyards and stickers as I can take in my suitcases! While this episode was produced in exchange for a table at the show, I am absolutely thrilled to be a part of this and I do hope to see you there! Here’s hoping I can secure interviews with some of the guests, too.